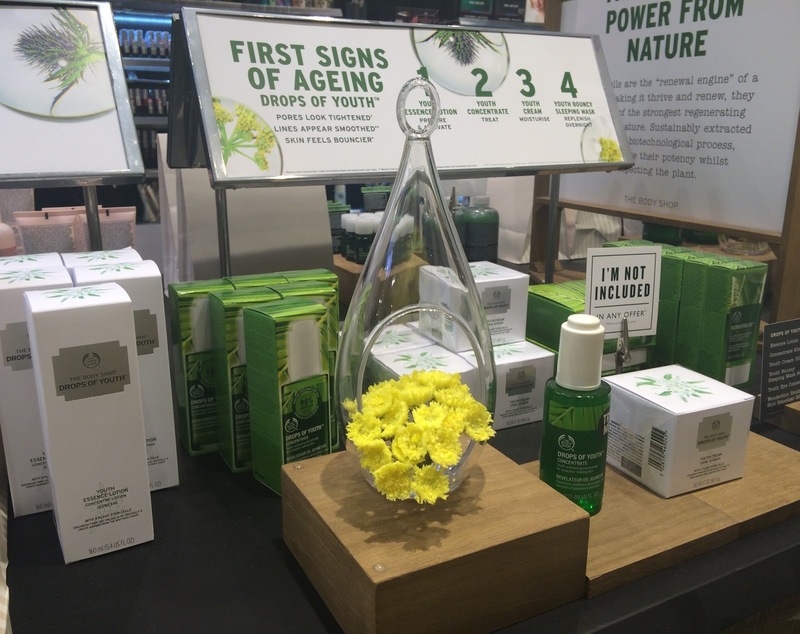 The other week I was invited along to a blogger event at The Body Shop for a little introduction to the Drops of Youth range. Although this range has been around for a while, there were some new additions to the youth enhancing skincare and I was certainly intrigued to find out more as I'd not tried any of it before. We had such a warm welcome from The Body Shop team and after introductions Jaz, their skincare expert give us a demonstration of all the products. She was extremely passionate and excited to pass on her skincare knowledge. The team then went on to offer personal consultations for those that wanted one and the products were laid out for us to get our hands on and try. There are now six products within this range and I was especially eager to try the Drops of Youth concentrate, the Bouncy sleeping mask and the eye concentrate. So first off, the Drops of Youth concentrate enriched with plant stem cells to instantly nourish and moisturise. This has a thin gel-like texture which seemed to instantly disappear into my thirsty skin. I think it smells a little medicinal in my opinion, but fresh at the same time, not unpleasant in any way and it certainly wouldn't put me off using it. I was given a couple of sample sachets when I left and I have been giving it a trial run. You only need 2/3 drops (under your serum/moisturiser) and it does leave your skin velvety soft. The Bouncy sleeping mask was the one I was really intrigued about and is to be worn overnight after applying your skin concentrate. It's enriched with Edelweiss stem cells which helps to give it it's youth enhancing formula for bouncier looking skin. It's a strange texture, almost like memory foam, you touch it, nothing is picked up by your finger and the indentation left there just bounces right back! A spatula is provided to extract this jelly like substance. I've tried this just the once, and my skin did feel a little bouncier by morning but I think it's hard to be 100% certain after just one use. I was given a couple of samples so will give it another go as I'm excited to see my saggy skin bounce right back. The eye concentrate is the one I definitely want to buy. Tasha tried it on my hand, I wasn't about to put it under my eyes and watch my eye make-up slide off in front of everyone that's for sure, and I found the roller ball was so cooling on the skin. Again enriched with Edelweiss it apparently helps with fine lines (although mine aren't fine!) dark circles and puffiness. There have been some mixed reviews on this regarding the results and the price, but I will buy this and see how it works for me. The other products are the essence lotion, to be used daily after cleansing, the Drops of Youth Youth cream, a light moisturising cream infused with three plant stem cells, and the wonderblur to wonderfully blur out those fine lines. I'm happy with my current toner, daytime moisturiser and primer so won't be trying these ones out just yet. With the samples that I've tried from the goody bag (thank you Body Shop) I must say I'm very impressed and the eye concentrate is the first thing on my list! Have you tried the Drops of Youth range? What are your thoughts? Love this Steph! I've been so impressed with the Concentrate and will 100% be buying it once the samples have been used. They're lasting forever, which is awesome! I feel like all I've done for the last week is rave about the stuff! I still want to try the Bouncy Sleep Mask but not sure if I will just yet because of the price, and I'm not sure it's something I'll use that often. Actually scrap that, we all know how tempting it is to buy all the products instore! Fab post Steph! Jealous you got samples of the sleeping mask - I really want to try! :) I love the feel of the concentrate & I want to get my hands on the eye concentrate too! Pay day treat maybe! Great post! Just shared it on Twitter! Think I'm gonna have to keep an eye out for this!